This month is Women's History Month and we're celebrating by highlighting the contributions of women to the field of urban theory. Last year we wrote about how the park was designed with women in mind, but that's only part of the story. A lot of Bryant Park's philosophy on public space comes from one of William "Holly" Whyte's mentees, Jane Jacobs, who took his initial theories and studies and extrapolated a new place based urban landscape with communities at the center. In her book, The Death and Life of Great American Cities, Jacobs lays out her concept of "eyes on the street." It is essentially a model of natural surveillance that focuses on crime prevention through environmental design. The idea is that when interacting with public spaces, people tend to respond to thousands of subtle visual cues that temper their attitude and behavior. If we see an empty park we tend to characterize it as boring and dangerous, and once that idea enters the communal psyche, individuals tend to shy away from it and its isolation compounds until it begins to become associated with anti-social uses. In the rehabilitation of Bryant Park, the Bryant Park Restoration Corporation focused on "eyes on the street" methods of remediation. Unnecessarily tall shrubs were removed, and exterior walls lowered, to allow for visibility and easy access to the park. Park management focused on fostering an inviting environment by introducing movable chairs that allowed visitors to dictate their interactions with the space as well as creating ledges and steps that could all provide hospitable seating. By maximizing visibility and fostering positive social interaction within the park, "eyes on the street" surveillance increases a perceived risk of "being caught" and decreases illicit activity within the park. According to Jacobs, however, this wouldn't be enough. Jacobs posits that "in cities, liveliness and variety attract more liveliness; deadness and monotony repel life." Her understanding of our interactions with space assumes that parks themselves don't necessarily act upon their surroundings. She understands that if a neighborhood is active and lively, its park will also be lively, and that this transaction requires a diversity of continual uses. Ideally, for Jacobs, the area surrounding a park would have a variety of diverse businesses and uses to provide continual traffic around the park as well as to create an abundance of interactions occurring around and within it. Unfortunately for Bryant Park, in the time before its rehabilitation, the surrounding neighborhood too had become stagnant and continuing negative perceptions about the park remained. So how could we work to reclaim the space under these parameters? Under Jacobs' philosophy, the interaction between a park and its surroundings is a two-way street. By finding ways to increase continued liveliness within the park, the park can affect the surrounding neighborhood. 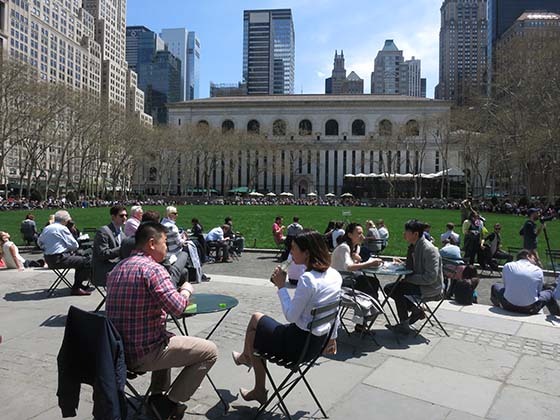 The Bryant Park Restoration Corporation infused the park with events and activities, which ensured a variety of uses, attracted visitors into the newly rehabbed space, and created a positive cycle of eyes on the street. In addition, the storefronts that surround Bryant Park create a dynamic mix of restaurants and retail that invigorate street life. In a way the Bryant Park Corporation is a bequest of Jacobean urbanist park philosophy. Through the unique use of programming, cultivating an open and inclusive environment, and by working with the local business improvement district to curate diverse businesses and uses around the park, we've created a truly special urban space. The year 2016 marks Jane Jacobs' 100th birthday. There will be programming around the city, organized by the Municipal Arts Society, to help celebrate her centennial. Here at Bryant Park, we're celebrating the anniversary by loading up on copies of The Death and Life of Great American Cities for the public to read at the Bryant Park Reading Room, opening April 1.